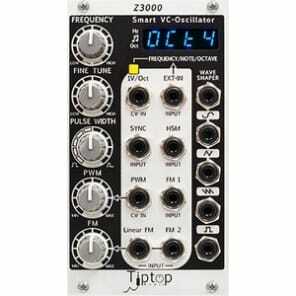 The Z3000 is an all-analog, voltage-controlled oscillator that gives you the ability to implement synthesis techniques in a controlled and planned manner, turning your modular system into an even more powerful musical instrument. The Z3000 is bilingual, equally fluent in the language of sound (frequency) and music (notes and octaves). 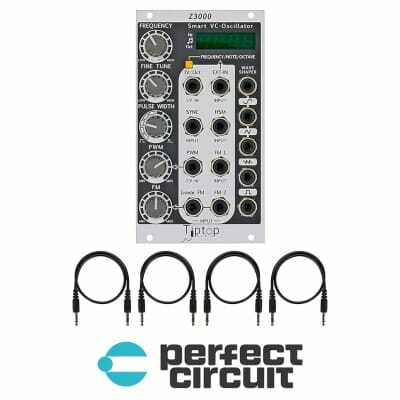 Its intelligence comes from its built-in arithmetic processor, which allows relevant data to be displayed constantly, taking the guesswork out of tuning your modular. The Z3000’s analog core generates four waveforms with substantial character, giving you a sound signature that can only be created by a true analog VCO. Its unique circuitry allows for high levels of synthesis complexity such as frequency modulation and hard sync modulation, all while maintaining excellent, wide-range tracking and without falling into chaos. The Z3000 brings a world of new possibilities that will give rise to a whole new sound spectra within your modular synthesizer. The Z3000’s first mode is Frequency Mode. The oscillator’s frequency is measured and displayed constantly, covering everything from low-frequency ranges to the upper end of the human hearing range. 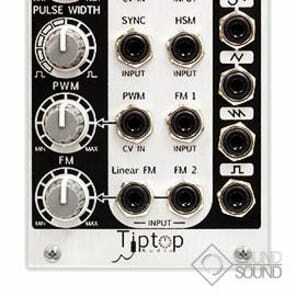 Setting up frequency ratios is important to any sound synthesis technique, the Z3000 now brings this capability to your modular synthesizer. You can easily tune and de-tune VCOs, space them apart in equal or unequal intervals, as well as tune a bank of VCOs in complex patches for the creation of either harmonic or inharmonic relationships. If you have multiple Z3000s, each will indicate its pitch, showing each individual tone in a patch, sound structure, or musical passage. It only takes a glance to stay informed. The Z3000 allows for unprecedented control of the most important modules in your synthesizer, your VCOs. Analog sound design is now more interesting, controlled, and calculated than ever before. The Z3000 MKII’s Musical Note Mode is a mix of frequency and musical notes. This mode is ideal for musicians and sound designers who want to more easily enjoy the benefits of using analog modular synthesizers. The capabilities are immense: set up VCOs with intervals for either dissonant or consonant notes, setting whole notes or semitones, transposing, tuning to a root, building chords, or just spacing octaves apart. Use it to implement synthesis techniques based on musical notes rather than just frequency. The same benefits sound designers have using the Z3000 MKII’s Frequency Mode are available to musicians too, allowing them to easily create tonal music. It has never been easier or more clear for musicians to work with analog VCOs. The Z3000 MKII does the math for you by converting frequency data to musical notes with the click of a button, building a bridge to the world of analog sound design. Octave Mode is a essentially a modern implementation of the mechanical octave switches found on many VCOs, freeing the module to sweep the full scale using the coarse frequency knob, but still allowing for easy octave switching. Knowing the octave range of an instrument and setting a C note is one of the basic needs of anyone using a keyboard, sequencer, quantizer or MIDI to CV interface to play VCOs. Setting the C note in any of the eight octaves is easy and fast and far more precise than what can be achieved with mechanical switching. Just set and play. Octave Mode also serves to compliment the Musical Note Mode when it is necessary to set a C note of a high frequency octave. In this situation, the frequency intervals between notes is large and the Octave Mode offers a range of within +/-50 cents of the C note, making the note easier to dial in at high frequency. 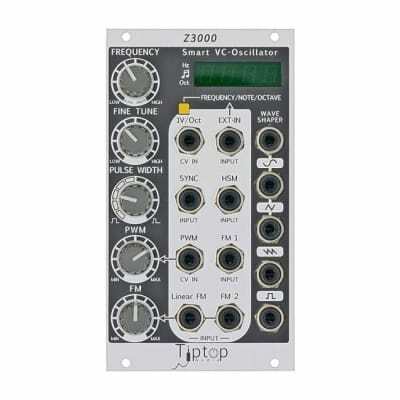 The Z3000 MKII provides several modulation inputs that can be used simultaneously. PWM, FM Hard Sync, HSM and Symmetrical Waveshaping. Frequency modulation (FM) is a widely used synthesis technique for creating harmonically rich sounds. Commonly found in a variety of digital synthesizers, the Z3000 MKII brings true analogue exponential and linear FM to your modular synthesizer. The Z3000 MKII offers traditional hard sync along with a new approach to synchronization called Hard Sync Modulation (HSM), which locks and rectifies modulated VCOs. HSM allows sync to be employed with FM, resulting in a huge tonal range coupled with precise control and tracking. The Z3000 MKII’s built-in waveshaper allows you to manipulate the sine and triangle waveforms without any additional processing module. Any control signal from your modular can be used to manipulate both of these raw waveforms, even at audio rate! The Z3000’s External Input allows access to the internal arithmetic processor, turning it into a multi-function chromatic tuner and meter for your other VCOs. 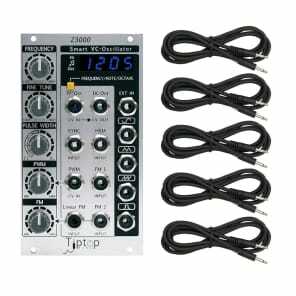 Because it is integrated into the module, it will save you space in your studio, so forget about long cables and plug adapters running to guitar tuners. 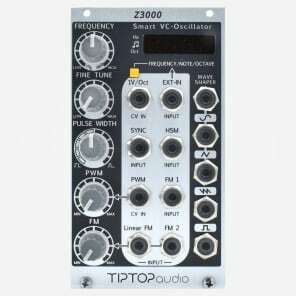 Using the Z3000 as a tuner is simple, just plug in any other VCO (from most manufacturers and formats) and use all three modes, frequency counting, note conversion or octave switching to set up and monitor that VCO, all while the Z3000 functions normally. This powerful feature allows you to bring more power and control to any VCO in your system.